Be JAV, Lenkija yra stipriausias mūsų sąjungininkas regione. Manau verta turėti atskirą temą mūsų svarbiausių ir stipriausių NATO kaimynų ginkluotosioms pajėgoms. Kad susidaryti šiokį tokį bendrą įspūdį, pakopipeistinu čia Wikipedijos (angl. versijos) informaciją apie Lenkijos kariuomenės įrangą ir ginkluotę. Poland Bayonet 6H4 Can be attached to AKM, AKMS, Beryl or Mini-Beryl. P-64 CZAK Poland 9 mm Makarov Semi-Auto Pistol P-64 Most are replaced by P-83 and WIST-94, but still in small use. P-64, P-83 and WIST-94 are to be replaced by new Handgun in near future. P-83 Wanad Poland 9 mm Makarov Semi-Auto Pistol P-83 Being slowly supplemented in military service by WIST-94. Still in heavy use in Polish Police services. To be replaced with 21,000 new pistols. P-64, P-83 and WIST-94 are to be replaced by new Handgun in near future. WIST-94L 20,210 P-64, P-83 and WIST-94 are to be replaced by new Handgun in near future. Poland 9 mm Para Semi-Auto Pistol P99 QA Limited usage in Polish Land Forces, mostly used by generals and officers. Glock 17 Austria 9 mm Para Semi-Auto Pistol Glock 17 1,500 In use by Military Gendarmerie. PM-06 +15,000 PM-98 and PM-06 are also use by Military Gendarmerie. MP5 Germany 9 mm Para Submachine Gun MP5A3 In use by Military Gendarmerie. M590 M50440 variant is used by Military Gendarmerie and M590 by Polish Army. SKS Soviet Union 7.62×39mm Semi-automatic carbine ksS 500 Only used by Polish Ceremonial Units (Army, Air Force, Navy). To be replaced by MSBS in near future. kbk AKMSN +50,000 Limited service in regular units, mostly in use on trainings and by reserve. Around 300,000 more are in storage. ~4,500 Mini-Beryl is also use by Military Gendarmerie. ~16,000 Standard issue weapon. Some old Beryls would be modernized to wz. 1996C standard. Planned to be supplemented by MSBS Radon. 158 SWD - Polish designation for SVD Dragunov. 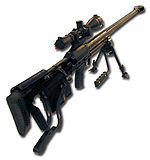 SWD-M version is a limited polish upgrade with new optics and bipod. 206 Also used by special forces and Military Gendarmerie. RPKS Limited use by airborne forces. 8 UKM-2000D/P is also used by Military Gendarmerie. Rheinmetall MG3 West Germany 7.62mm NATO general purpose machine gun MG3A1 ~600 Used on ex-Bundeswehr vehicles. More will be delivered because of order Leopards and Bergepanzer 2. Probably to replace with UKM-2000C/CL or WKM-B due to modernization. NSWT NSW - Polish designation for NSV. To be replaced by WKM-B. 8 NSW adapted to the .50 BMG NATO round. NGOS They can be fired from Kbs wz. 1996 Beryl and Kbk wz. 1996 Mini-Beryl. RGD-2CZ Only white and black smoke. UGD-200 UGD-200 Poland Smoke grenade Color or white smoke. Poland Anti-personnel grenade Being replaced by RGZ-89 and RGO-88. RG-42 Soviet Union Anti-personnel grenade Being replaced by RGZ-89. 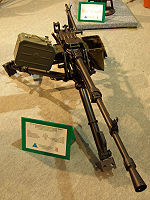 SPG-9N Limited use by airborne forces. 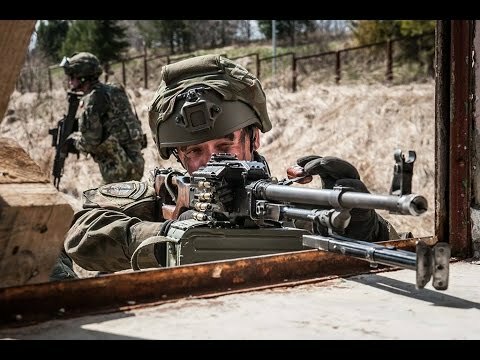 Carl Gustav Sweden 84 mm Multi-Role Recoilless Rifle 34 Used only by paratroopers and special forces. 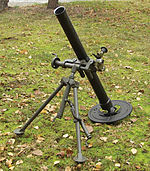 AT4 Sweden 84-mm portable single-shot recoilless smoothbore weapon Used only by paratroopers and special forces. wz. 1960/72 Unknown number in use at now. Most are replaced by wz. 83 Pallad-D.
wz. 74 Pallad Poland 40 mm Grenade Launcher It can be attached to AKM, AKMS, kbk wz. 88 Tantal and kbs wz. 96 Beryl. To be replaced by GPBO-40. GPBO-40 Poland 40 mm Grenade Launcher GPBO-40 450 Underbarrel grenade launcher, can be attached to kbs wz. 1996 Beryl. wz. 83 Pallad-D Poland 40 mm Grenade Launcher wz. 83 Pallad-D Also known as Wz. 1983 grenade launcher. To be replaced by GSBO-40. GSBO-40 Poland 40 mm Grenade Launcher GSBO-40 160 Stand-alone version with stock and pistol grip. Mk.19 United States 40 mm Automatic Grenade Launcher 150 Used mostly by Polish troops in Afghanistan. Probably to be replaced by GA-40. RPG-76 Komar Poland 40 mm Rocket-propelled grenade launcher ~90,000* *in storage. Some used by Polish troops in Iraq and in Afghanistan. Poland 72 mm Man-portable surface-to-air missile launcher 9K32M Strzała-2M 440 Being slowly replaced by Grom. PZR Grom Poland 72 mm Man-portable surface-to-air missile launcher Grom 400 2000 missiles. Around 400 missiles of newer version, "Piorun". 9K111 Fagot Soviet Union Anti-Tank Guided Missile System 100 Also fitted on Polish modernized BRDM-2. Will be replaced by Spike. 9K115 Metis Soviet Union Anti-Tank Guided Missile System 7 In use by airborne forces. Poland Anti-Tank Guided Missile System Spike-LR 264 Deal with Israeli manufacturer included production of components and assembly in Poland; incl 264 launchers ; total of 2675 Spike-LR version delivery 2004-2013. 2 All Leopards 2A4 from first batch (128) with an option for 14 more from second batch are going to be upgraded to Leopard 2PL standard. 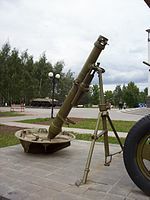 113 PT-91 - originally produced PT-91. PT-91M - PT-91 upgraded to PT-91M standard. 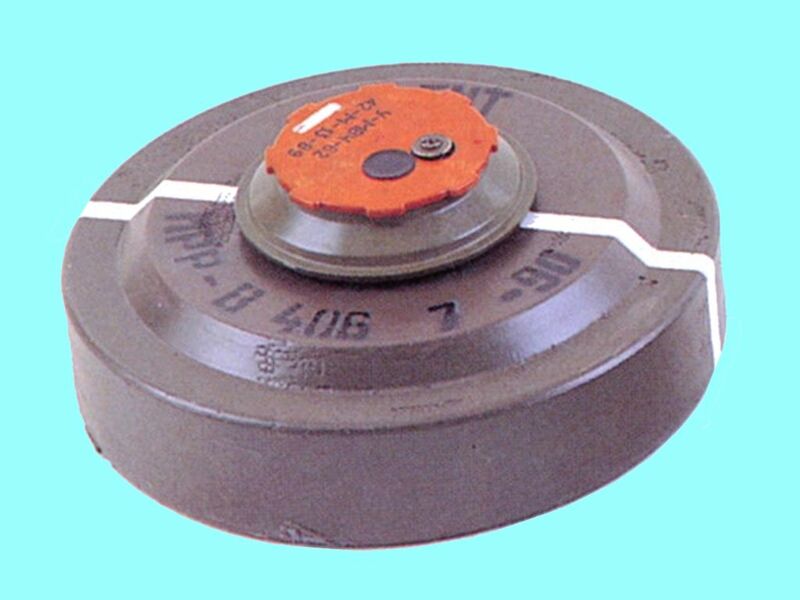 PT-91MA1 - T-72M1 upgraded to PT-91 standard.
? Are being withdrawn from service. 379 T-72 tanks will be stored and kept operational until 2018. 159 T-72s are operational. 16 BWP-1 - Polish designation for BMP-1. BWP-1D - Polish designation for BMP-1K (MP-31 in Polish service is sometimes also called BWP-1D). BWR-1D - Polish designation for BRM-1K. BWR-1S - Polish designation for BPzV "Svatava". Rosomak-WSRiD 570 Rosomak - wheeled infantry fighting vehicle(in future it can be armed with Spike-LR, to replace the Rosomak-S). Rosomak-M1 - modified variant of Rosomak for use in Afghanistan. Rosomak-M1M - up-armored Rosomak M1 with QinetiQ RPGNet anti RPG net and new "sand" camouflage. Rosomak-M3 - armoured personnel carrier, armed with .50 BMG WKM-B or Mk 19 + PKM or UKM-2000 as secondary weapon. Rosomak-S - armoured personnel carrier carries full squad with two Spike-LR ATGM. Rosomak NJ - vehicle for driver training. Rosomak-WSRiD - recon and command vehicle. 2 The MT-LB L vehicles are used for driver training. MT-LB Z, MT-LB R and WD krel are a part of the Przebiśnieg electronic warfare system. dozen BRDM-2RS - Polish designation for BRDM-2RKhb. 8 are in service with the Polish Navy. 10 BRDM-2M-96ik were used by Polish forces of ISAF. However they are now together with 12 vehicles used in Iraq, back in Poland. 1 M1043A2 with Kobuz RWS, sometimes referred as Tumak-4. Skorpion-3 Poland Four-wheel Multi-Purpose Drive Vehicle Skorpion-3 90 Armored heavier Honker version. Bergepanzer 2 Germany Armoured recovery vehicle Bergepanzer 2A2 10+18 18 on order, to be delivered in June 2014. All of them (28) are going to modernized to Bergepanzer 2PL standard. PTS Soviet Union Tracked Amphibious Medium Transporter PTS-M A small number are used by the Land Forces. 50 are in service with the Polish Navy. ISM Kroton Poland Minelayer 6 Opal-II landing. Poland Armoured bridge layer BLG-67M2 126 Used by tank and mechanized subunits. To be replaced by MG-20 Daglezja-G.
PP-64 Wstega Poland Pontoon bridge 60 Transported by 70 Star 266 AP-64 and Star 266 BP-64 trucks. EOD-9 Bomb suit United States Protective bomb suit Latest model heavy high protection suit. 3 P/S662D.43, P662D.43, P662D.35 and P662D.34 are different variants of JELCZ-662, P642D, C642D.35 and C642D.34 are different variants of JELCZ-642, P/S862D.43 is a variant of JELCZ-862, P/S842D.43 and P/S842D.35 are different variants of JELCZ-842. Daimler BenzUnimog Germany Truck 1300L 29+40 40 on order, to be delivered in June 2014. Mercedes-Benz Germany Truck Mercedes-Benz 1017A 91+120 120 on order, to be delivered in June 2014. M40.12WM 460 Stralis AT260S35Y/P is used by Polish Ground Forces along with high capacity trailers. Eurotrakker MP 720E 47 WT are used along with ZREMB NS 600W trailers for transport of tracked vehicles and containers. It can also be used to evacuate damaged equipment in a similar fashion to ARVs. M40.12WM is used as a biological reconnaissance vehicle. Tatra Czechoslovakia Truck Tatra 815 Only specialized variants are in service. KrAZ Soviet Union Truck KrAZ-255B Only specialized variants are in service. Ural-4320 Only specialized variants are in service. Kamaz Soviet Union Truck Only specialized variants are in service. GAZ Soviet Union Truck GAZ-66 Only specialized variants are in service. ZIL 157 Only specialized variants are in service. UAZ-469B-rs 38 Only specialized variants are in service. 0 40 MB 250 on order, to be delivered on June 2014. Polish Armed forces currently operate a total number of 140 G-class vehicles.The military police uses 13 GD 290s. Land Rover Defender United Kingdom Four-wheel Multi-Purpose Drive Vehicle +110 10 of them are in use by Polish Land Forces, while the rest are in use by Military Gendarmerie. Ford United States Van Transit Used as a low-capacity transport vehicle which can carry up to 4 tonnes of cargo. Seicento Van "W" Both are used as low-capacity transport vehicles which can carry up to 4 tonnes of cargo. 3 More on order due to Regina program. KTO Ryś Poland Armoured wheeled command vehicle KTO Azalia 1 Only prototype. Lotos Poland Armoured ambulance TS Lotos 1 MT-LB landing. 46 Used as a 4x4 ambulance. Poland Four-wheel Drive Multi-Purpose Vehicle Tumak-7 3 M1035A2 version modified in Poland to ambulance vehicle. NUR-21 NUR-21 Poland Radiolocation Station 20 Used for locating aircraft flying at low altitudes. NUR-22 Poland Radiolocation Station 10 Based on Tatra 815. Used for locating aircraft flying at low altitudes. Poland Self-propelled surface-to-air missile system SNR PZR S-125 Newa-SC Radar support S-125 Newa Self-Propelled Surface-to-Air Missile System. Liwiec Poland Artillery Support Radar 3 7 more on order. D-44NM 70 To withdrawn from service. Poland 122 mm Towed Howitzer Wz. 1938/1985 2 Towed by Star 266 trucks. As of 1 January 2008 additional 2 Wz. 1938 howitzers were withdrawn from service and awaiting for further disposal. Krab Poland 155 mm Self-Propelled Howitzer 8 Along with the modernized prototypes they will form 6 squadrons consisting of 24 vehicles (total of 120 ordered). More purchases are planned after 2018. BM-21 Grad Soviet Union 122 mm Self-Propelled Multiple-Launcher Rocket System 135 Between 113 and 114 will be modernized to WR-40 standard, the rest will be scrapped. Poland Tank Destroyer 18 M1045A2 with Spike LR mounted on top. 20 Approx. 50 more ZSU-23-4 are to be modernized to ZSU-23-4MP Biała standard. Hibneryt-3 ~70 ZU-23-2, ZUR-23-2S Jod or ZUR-23-2 kg Jodek-G (Hibneryt-KG) mounted on a Star 266 truck. Some Hibneryts are going to be modernized to newer versions like Hibneryt-P or Hibneryt-3. PZA Loara Poland Self-Propelled Anti-Aircraft Gun PZA Loara-A 2 2-6 units produced, the original order of 48 was canceled in 2009 due to other priorities. Poprad Poland Self-Propelled Surface-to-Air Missile System Zubr P 2 79 POPRAD planned. 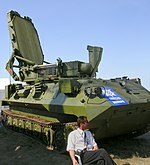 2K12 Kub Soviet Union Self-Propelled Surface-to-Air Missile System 2K12M Kub-M 30 30 is a number of TELs. Polish-Hungarian modernization program in development. Poland Self-Propelled Surface-to-Air Missile System Osa-P 64 64 TELARs form 16 batteries. Poland Self-Propelled Surface-to-Air Missile System S-125 Newa SC 60 60 TELs form 20 squadrons. S-200 Wega Soviet Union Surface-to-Air Missile System 12 12 launchers form 2 squadrons. 15? Two attack squadrons with 12 helicopters, 4 Mi-24W used by SOS. Some are equipped with the Terma A/S MASE (Modular Aircraft Survivability Equipment).3 Mi-24W lost in Afghanistan. To be retired, will be replaced with 32 new attack helicopters. Mil Mi-8 Soviet Union Tactical transport helicopter Mi-8T 16 One squadron with 16 helicopters. Will be replaced with Airbus Helicopters H225M. 12 One squadron with 16 helicopters. Some with the Terma A/S MASE. 11 Two squadrons with 12 helicopters each. PZL W-3 Sokół Poland Combat search and rescue W-3PL CSAR Głuszec 8 One CSAR squadron with 8 helicopters. Mil Mi-17 Soviet Union Medical evacuation Mi-17AE 2 One medical evacuation squadron with 4 helicopters (2 W-3 and 2 Mi-17). PZL W-3 Sokół Poland Medical evacuation W-3WA AE Sokół 2 One medical evacuation squadron with 4 helicopters (2 W-3 and 2 Mi-17). 1 One electronic warfare squadron with 4 helicopters. PZL Mi-2 Poland Training helicopter Mi-2 NVG 16 One training squadron with 16 helicopters. 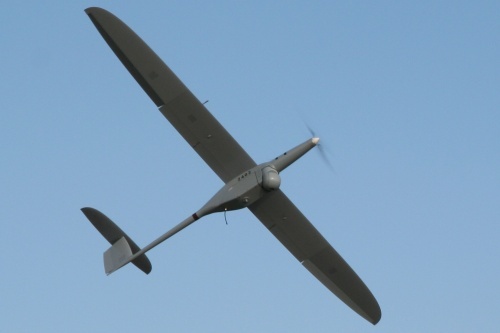 Aeronautics Defense Orbiter Israel Small UAV 18 also operated by Polish Special Forces. Rheinmetall has booked another major modernization order for heavy tanks. Poland has just awarded the Düsseldorf-based Group a contract for overhauling 128 Leopard 2 MBTs. In cooperation with Poland’s Polska Grupa Zbrojeniowa (PGZ) and ZM Bumar-Łabędy S.A., Rheinmetall will serve as a strategic partner, supplying crucial key capabilities, including electronics and weapon technology. The project represents roughly €220 million in sales volume for Rheinmetall. During the course of modernization, the 128 Leopard 2 A4 main battle tanks purchased in 2002 by the Polish Army from surplus Bundeswehr stocks will be upgraded to Leopard 2 PL standard, which corresponds to the German Leopard 2 A5 and A6. Following Canada and Indonesia, Poland is now the third Leopard user nation to turn to Rheinmetall as the technology partner of choice for a major modernization programme. Besides the Bundeswehr, the armed forces of 17 countries now have Leopard 2 tanks in their inventories. Rheinmetall’s willingness to share technology and operate in tandem with local industry proved decisive in prompting the Polish government to select Rheinmetall as its strategic partner. For Poland, the contract will mean the creation of highly skilled jobs as well as obtaining valuable defence technology know-how. On 28 December 2015, the Armament Inspectorate of the Polish armed forces awarded PGZ (as general contractor) and ZM Bumar-Łabędy S.A. (as integrator) a contract to upgrade the combat effectiveness of the Leopard 2 A4. Rheinmetall played a key role in preparing the upgrade package, having already established itself as a strategic partner by this point. Just signed, the contract lays out the details of Rheinmetall’s role in the modernization package. Na UK/FR lygio nesieks jau vien dėl lėktuvnešių neturėjimo. Bet kad bus rimta karinė galybė, kurios bijos Putleristanas, tai tikrai taip. 2015 05. Lenkų Mewos dvi nuotraukos. Laivas analogiškas Flamingui. Lenkijos Gynybos ministerijos sekretorius Bartosz Kownacki naujienų agentūrai PAP pranešė, kad Lenkija planuoja pakeisti apie 1000 dabar naudojamų pėstininkų kovos mašinų BWP-1 ir BWP-2 naujomis, ir planuoja tam išleisti apie 5-20 milijardų USD. Vienok. Dar praneša, kad svarsto galimybę naujose mašinose naudoti 155 mm savaeigės haubicos Krab šasi, kurios licenziją nusipirko iš Pietų Korėjos. Karo muziejus kaip tik tokių neturi, kaip ir dar labai daug ko.